When disaster strikes, airport staff must react quickly and decisively - almost instinctively. That's why annual emergency training is so important. It helps employees perform appropriately and safely by providing opportunities to practice their particular roles in prescribed response procedures. Rochester International Airport (RST) recently enhanced its training regimen by adding crisis communication components to its latest full-scale safety exercise. 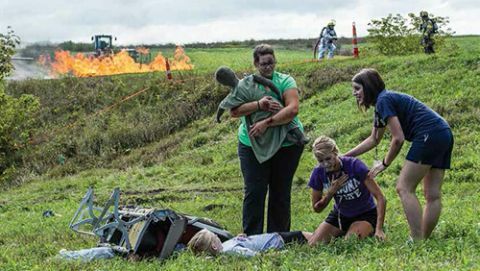 Aircraft rescue and firefighting staff, ramp workers and other frontline employees were under scrutiny during the Minnesota airport's four-hour mock disaster; but employees handling media relations were also put to the test. To increase realism, RST added the wildcard factor of social media. Putting it mildly, social media has turned the field of crisis communications on its head. Whether it's a hurricane, inflight incident or trouble in the terminal, the public expects information and updates much faster and more often than it did just a few years ago. Typically, people learn details and see photos via Facebook, Instagram and Twitter before airports issue official statements - often well before reliable facts and information are available. Allowing RST's communications staff to feel the breakneck speed of social media during a staged training scenario helped them understand how news of airport disasters literally races forward. Firsthand experience trying to keep pace with a story - and possibly get ahead of it - was deemed highly beneficial. "We knew it would be a very good learning experience," says Tiana Rossow, the airport's marketing and communications manager. "In the real world, we needed to know how the communication would be conveyed." The multi-agency communications team used a cloud-based application called SimulationDeck to train privately on social media tools without compromising security and safety. The system, by Nusura, replicates the functionality of Facebook, Twitter, Instagram, YouTube and web blogs, as well as more traditional media such as television, newspapers and radio. "Social media and other emerging digital technologies are playing an increasingly essential role in responses to natural disasters, terrorist attacks, civil and political unrest, criminal investigations and military operations," says Mark Amann, senior vice president and chief executive officer of Nusura. "These technologies not only provide a unique opportunity for organizations to communicate directly with the public, but they also are a source for previously unavailable situational awareness and intelligence." Social mapping is one of SimulationDeck's newer capabilities. The application uses geographic information system technology to show clients where posts on social media are coming from. "In real incidents, geo-tagging of social media posts has proved essential to enhancing situational awareness and driving decision-making," explains Amann. RST did not use the social mapping feature during its recent training exercise. Beyond social media, RST's training scenario addressed scene command operations, triage and transport of victims, crime scene and fatality operations, family assistance and mass-alerting public messages. "In 2012, the triennial airport exercise tried to accomplish unified scene command, public information and family assistance, and we were partially successful," recalls Ken Jones, director of emergency management for the city of Rochester. "For 2015, our goal was to emphasize the need for true unified operations at the scene, within family assistance operations and joint public information center activities." The exercise specifically tackled the common issues of conflicting command teams and uncoordinated public messages. When command teams did not appear to be working together, trainers used "injects" to steer teams together and force them to work in a unified command structure. Family assistance center operations were extended to the community Emergency Operations Center and hospital family support center. A new fatality management plan that was created after the 2012 exercise provided a live playing field to train medical examiner staff and police department investigators. "This exercise was deeper and more challenging, and the teams benefited greatly," Jones reports. While the previous full-scale exercise identified one person as the sole public information officer, this year's exercise used a community team to coordinate scene communications with social media messages and press releases. "Tiana (Rossow) is the only person on the airport staff who handles communications, so in an emergency situation we would rely on the surrounding community to act as public information officers," explains Jones. "When you thrust people into an emergency situation, it's hard to get everyone together. In the exercise, we wanted to get them used to working together." During the 2012 exercise, the team discovered that the public information officer became so engrossed in some aspects of rescue duty it became difficult to provide timely information to the media. In that case, Mayo Clinic was forced to handle media inquiries, which proved to be inefficient. "With such a small staff, it's important for us to have community helpers in a case like this," says Rossow. "This simulation helped us get to know each other and ensure we have each other's contact information so we know who to rely on." Given the opportunity to learn how to respond during an airport emergency, community resources outside of airport operations, such as personnel from the library or public utilities, could be great assets if we understand how to work together, she elaborates. During the exercise, the RST team established a Joint Information Center, which was specifically designated for members of the airport/community communications team, as well as a separate Media Center for outside newsgatherers on airport grounds. Team members also held a simulated press conference, with mock media members trained to ask tough questions like real reporters. "Using SimDeck, we could respond to radio and TV reports, and we got to follow Twitter and Facebook posts to practice how to respond after the incident," recalls Rossow. "Very quickly, you see how the airport can be affected by the public perception." One of the biggest lessons was learning how to ensure a good flow of information without communicating too much. "Everything happens so quickly that you have to be able to react quickly, but not with anything that could be inaccurate," she explains. "You have to be able to confirm details before you put them out." Not speaking on behalf of the airline was another key takeaway. "As the airport operator, there is very limited information we can speak about," Rossow relates. "We just want the public to know that we're communicating and involved." The simulation also prompted the communications team to consider logistic details such as information technology resources needed to operate remotely. "If I don't have access to my office, I need to know how to respond," she explains. "What would I need? Where is that backup location? How do I get more hands on deck to help with the fast-paced information that is flowing? Taking the time to think about that is important." With RST's full-scale exercise complete, participants are still reflecting on lessons learned in September. The power and speed of social media made an impression on the communications team. "Rochester's team has had the opportunity to experience all of the communication surprises and distractions that could potentially be hurled their way by using the tool," notes Nusura's Amann. But even as a six-year Federal Emergency Management Agency veteran, he is careful not to use the word "expert" when talking about any social media practitioners. He also eschews the word "expert" when it comes to social media, and he refers to "promising practices" rather than "best practices." "It hasn't been long enough for us to learn about what works perfectly," Amann explains. "The challenge in the real world is that things happen much more quickly and organically than I could imagine." The challenging dynamics of social media helped inspire him to found Nusura. "We felt there was a huge gap in what we were able to train and the way the demands of the media concerned citizens and elected citizens," he relates. "Even in a small disaster, people need to be adequately prepared. There was a gap in realism in how they trained and what happened in the field." SimulationDeck is sold as part of a larger emergency preparedness program; via an annual subscription; or as a one-time purchase. Given his background, Amann fully expects the influence and importance of social media to continue increasing. He also predicts that new media channels will continue to provide challenges - and opportunities - for teams responding to emergencies. As average citizens with cellphones continue to document emergencies faster than official authorities, airports need to practice how to react. "Every airport should strive to make it as realistic as possible. This allows you to feel the heat ... and it makes you better at providing timely, accurate, good information," says Amann. "Information can save lives and reduce human suffering. Information is a commodity. Getting info to people quickly is key." Jones, from his post with Rochester's emergency response department, agrees: "Better decisions help us save lives and protect our employees and customers. These exercises are a great opportunity to fail in a risk-free event. We had a chance to make mistakes in a good way, and we learned so much from our mistakes. In the case of a real disaster, we are as prepared as we can be, and that's important."